26 July 2018 was a validation that our vision for e-learning is on track. 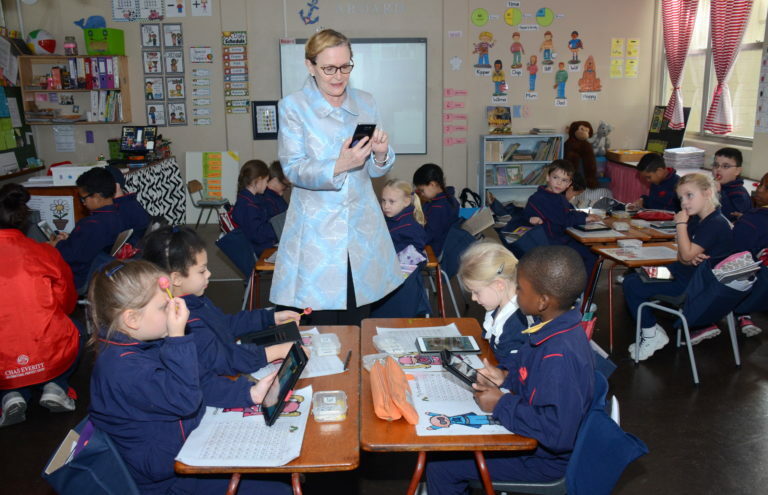 We were very privileged to welcome Premier Helen Zille to Eversdal. The Premier has a focus on education, specifically e-learning and was excited to see what the school is doing. After we discussed our technology integration journey since 2012, we could share our infrastructure developments and how other schools could benefit from our model. The fact that we have a very effective infrastructure, that is less expensive and sustainable were interesting to the Premier. She was impressed by our relationship with Klapmuts Primary School and how the two schools work together. We could demonstrate our new curriculum and teaching through OneNote. This was a very exciting part of the discussion and it was a validation for us to know that our philosophy is in line with the Western Cape Government’s outcomes. On the school tour we stopped at several classes so that the Premier could see how we teach. Our new horse shoe desks in Grade 1 and Grade 4 made for interesting conversations about classroom management. We also walked into classes in different grades. We showcased our STEM room and Science laboratory and she experienced first-hand how learners code. The Premier enjoyed all her interaction with our Evers. We would like to thank her for taking the time to visit Eversdal. everyday along with a mug ᧐f coffee.